Beauty and the Gamer: Sweet Delights Divalicious Sample box Review! Yes, you read right! It's another box! 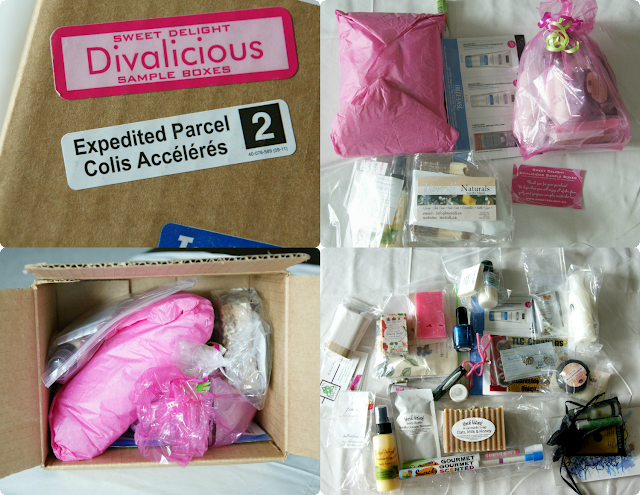 Sweet Divalicious Delights is a sample box and is slightly different from the rest (i.e. TopBox, Luxebox, Glymm, and Glossybox). 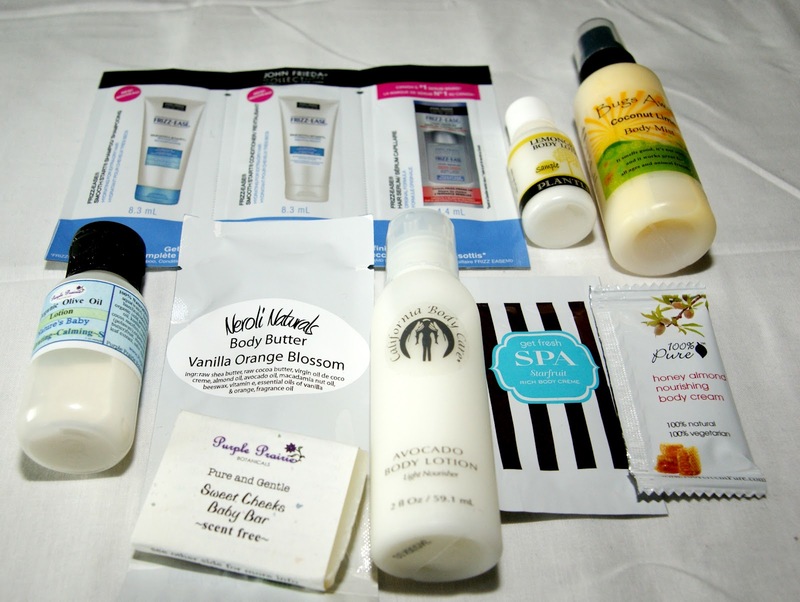 This box is seasonal (kind of like the new Luxebox format) and guarantees anywhere between 10-15 sample to full sized items, all for $26 (includes shipping). The items range from beauty items to jewellery. 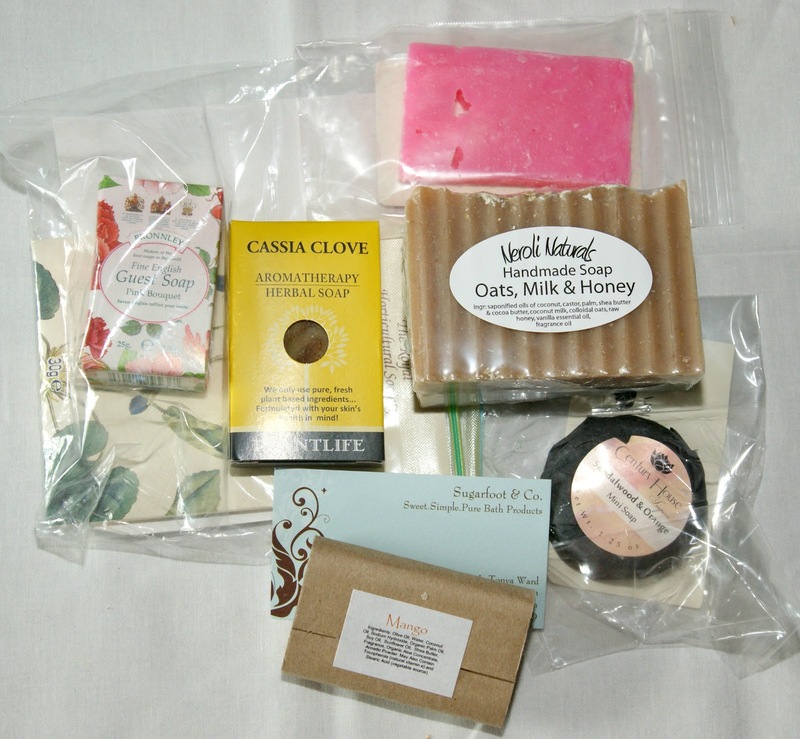 The majority of the items are natural and organic and form "local" artisans and companies (YAY!). This box ships to Canada and US. It's important to sign up for their newsletter because they often send you sneak peeks and let you know when the box is going on sale. It is first come, first serve, so once they sell out, it's out. This box sold out in 2 hours!!!! When I first received the box, it was chock full of goodies - and I mean brimming! Acrylic Graphic Design Picture - I don't know what to do with it, but it's interesting. Gourmet Scented Pencils - grape and bubblegum. I'm a pen girl, so I think that I'll be giving these away to my niece. Del Sol colour changing nail polish. A BUNCH of soaps. They range anywhere between guest sized to deluxe size. All smell delicious! Bugs Away natural bug spray. Cool! This is a fair sized sample, and with the wet weather that we've been having, I'm probably going to need it! Jewellery!!! I received a very cute peas in a pod pendant, pie on a plate with fork and knife earrings and a red swarovski flower pendant. I love the peas in a pod pendant. It's very delicate and pretty. So, this is the box! I'm not sure if I'm going to get it again. The one good thing about this box is that they let you see the box contributors, with links to their website, so you can check them out before you purchase the box. What do you think of this box? Did you order one? Del Sol Nail Polishes are a lot of fun! Especially for this summer. They are already $10! I bought 3 of them when I was in the carribean! I love those Del sol nail polish, ive been to the Carribean and they have stores in St thomas, st maarten etc. i pranked my friend once and painted hisnails with the clear del sol nail polish and went out in the sun, he was amazed when he noticed hes got red nalis! LMFAO! and LOL at the Monkey Farts lip balm! what does it smell like?? i just noticed the avocado lotion. i like avocados so i wonder if i would like it in a lotion format too.. 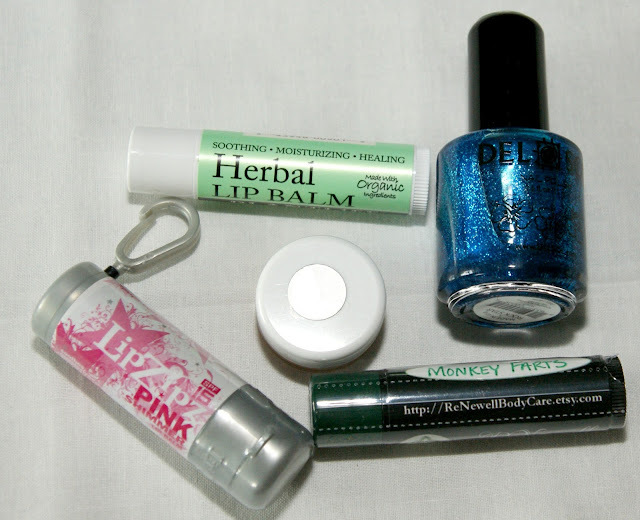 I"m a little afraid to open up the Monkey Farts lip balm and take a whiff..... LOL! I'm just about to post what I got, but I love your box! I was most excited about the Del Sol nail polish! You got an awesome colour! I got a coral pink! oooh! I can't wait to check out what is in yours! LOL, what ARE you going to do what that graphic acrylic art? I got different lip balms than you. I still got the Lip Zipz (in a citrus scent), but I got a lip balm where the whole stick is made of three flavours and you can snap off the flavours if you get bored of one! Were you up super early to get this box? I was up at freakin' 5am. I set my laptop up so that all I had to do was click "BUY"! Your lip balm sounds cool!!!! I wasn't up too....early....LOL! Actually, I was already up and at work (7am-ish), so I think that I lucked out and snapped up one of the last ones! Oh what an awesome box!!! This is really cool, you get quite a few things there! what an awesome box! I haven't heard of this before. It's much better than the regular beauty box. Curious to see what the Monkey Fart lip balm taste/smell like haha! I will definitely let you know what it smells like. Oh heck, I'll just open it right now.....Hmmmm....like minty bubblegum. LOL! WHEW! Looks really neat! I hope the monkey farts lip gloss doesn't smell that way... lol! EEEWWWWW!!! ME TOO! :) lol! thanks for leaving a comment on my giveaway and for following me! your support means a lot to me :) I have followed you as well! good review post too! YW! And thanks for the kind compliment! LOL! It isn't too bad. There's a lot of natural stuff! I'm just glad that this isn't every month and I get to preview the contributors before I purchase! Thanks for stopping by! This box looks awesome! I've never heard of it before. I really want to order from 'Little Black Bag'. First of all, I'd like to say that I totally appreciate the name of your blog. Who says that nerds can't be fashion people! And it looks like a pretty good mixed box, but the scented pen is a tad random. Thanks for the compliment! And thanks for following! Great box!!! I love the colour of polish you got..I was a little bummed with mine! Which colour did you get? I'm not exactly impressed with this colour. Well, no, it's a fantastic colour, but I have two other polishes that are very similar! I think mine is green and it changes to purple..? I'll be doing a post about it this weekend. Maybe I'll even test it out. INteresting mix of products - I did not buy one. I probably wouldn't either just because I'm picky about what I like and I have lifestyle requirements - Everything needs to be vegan! Btw, I found you on BlogLoveTherapy. Hi! I don't think that this box is for everyone and I"m not even sure if I'll order another one when they next come out. YAY Alberta! Thanks for the follow! Heading to your blog to follow you back!